CENTRAL CITY – Rhoby M. McDonald, 87, of Central City, died Saturday, June 21, 2014 at the Muhlenberg Community Hospital in Greenville. 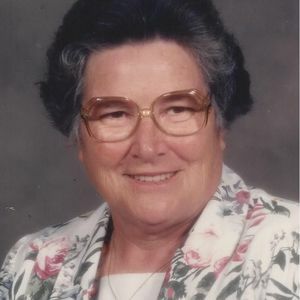 She was born September 1, 1926 in Grayson County, was a homemaker and a member of the Cherry Hill Baptist Church in Central City. Mrs. McDonald is preceded in death by her husband of 58 years, Everett McDonald in 2002. Survivors include her son, Tommy (Vicki) McDonald of Martinez, CA, a daughter, Ann (James) Dukes of Central City, three grandchildren, Kathy Dukes, Dee Snider and Krisi Brown, and four great grandchildren. Funeral services will be held at 11:00 AM, Tuesday, June 24, 2014 at Tucker Funeral Home in Central City conducted by Rev. Leroy Rearden and Rev. Travis Fox with burial to follow in the Cherry Hill Cemetery in Central City. Visitation will be after 5:00 PM Monday and after 8:00 AM Tuesday at the funeral home. The beautiful and interactive Eternal Tribute tells Rhoby's life story the way it deserves to be told in words, pictures and video.